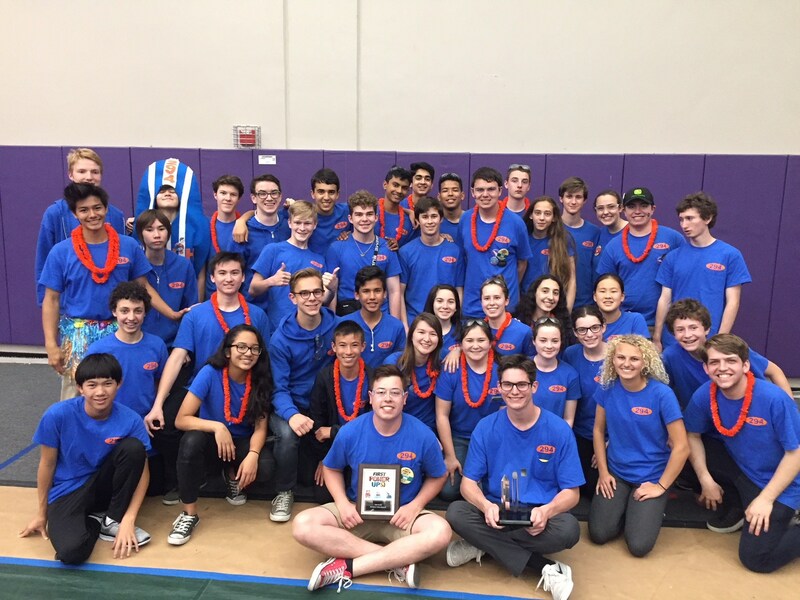 This weekend the robotics team placed 2nd at the Aerospace Regional in Lancaster. This was high enough to earn a ticket to play in Houston April 18th – 22nd! At the end of the qualification matches, we were ranked 4th place overall. 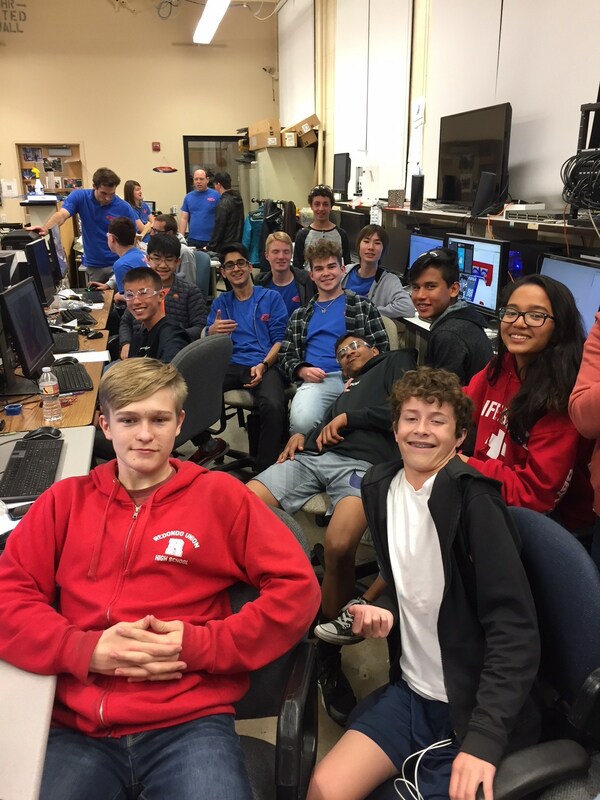 We formed an alliance with 2 other teams: 399 Eagle Robotics (from Lancaster) and 3490 (a team that travelled all the way here from Turkey!). 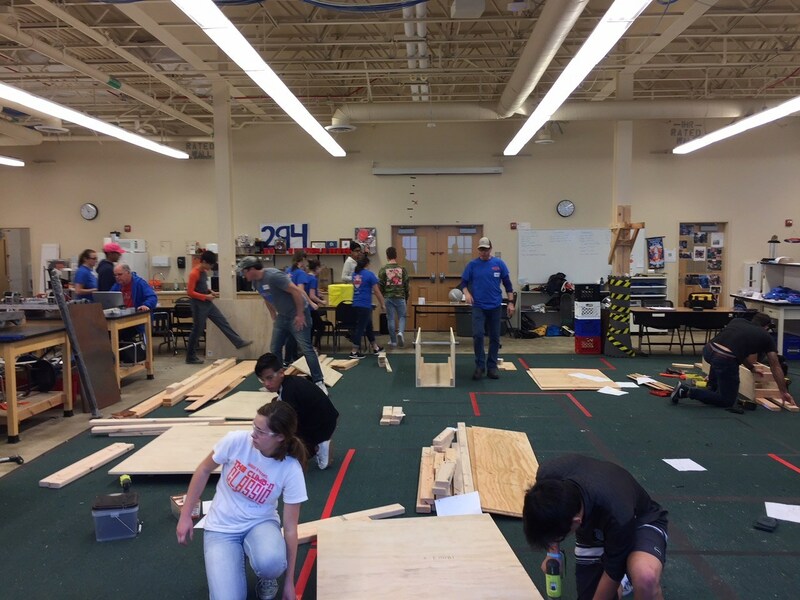 During the quarterfinals we faced the 6th ranked team and were able to win (best out of 3). After, we played against the 2nd ranked team overall. We won our first match against the alliance, but lost the 2nd. 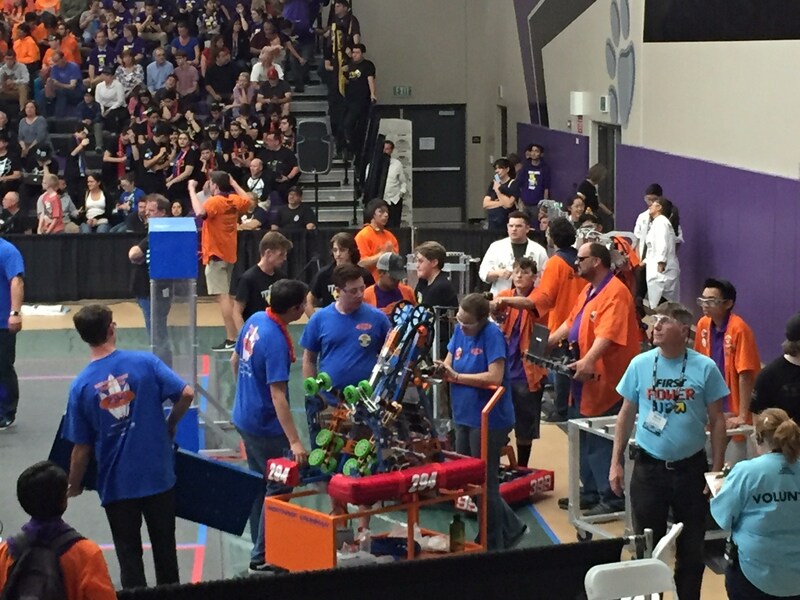 Moreover, during the 2nd match the intake on the robot broke. (This is the part that rolls in the game cubes into the robot for it to pick up and them place on the different scales on the game field.) 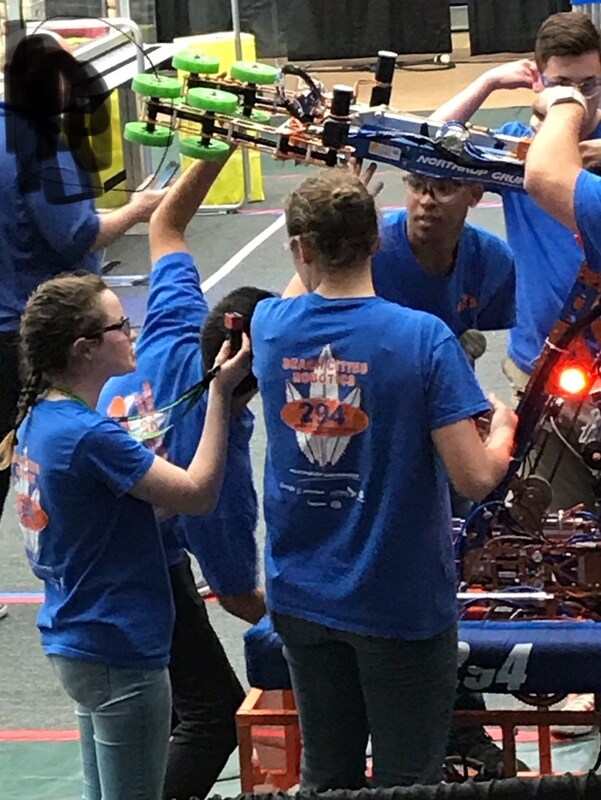 Since we only had 6 minutes to make any repairs on the robot, the team decided to take the entire intake off of it and play without it and instead focus on playing defense against the other robots on the field. Fortunately, our strategy paid off and we were able to win the third match even without an intake on the robot. We fixed the intake for the first match of the finals (against the ranked first place team). 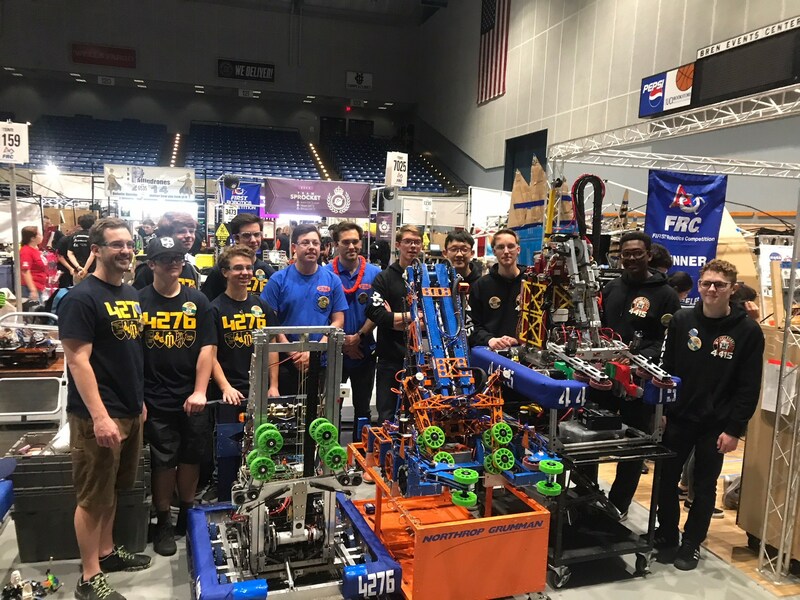 With a working intake, we won the first match of the finals, but unfortunately it broke again toward the end of that match. 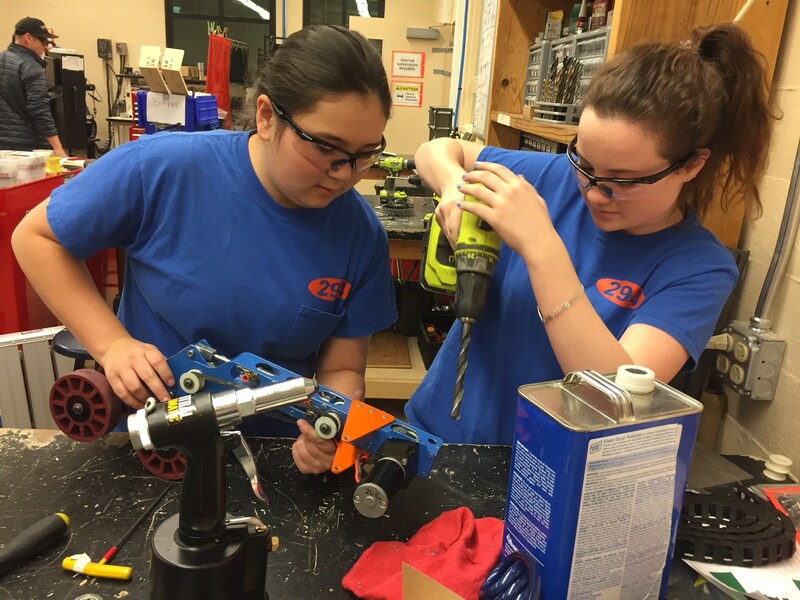 Without time to fix the intake again, we played the team twice more and lost both matches. 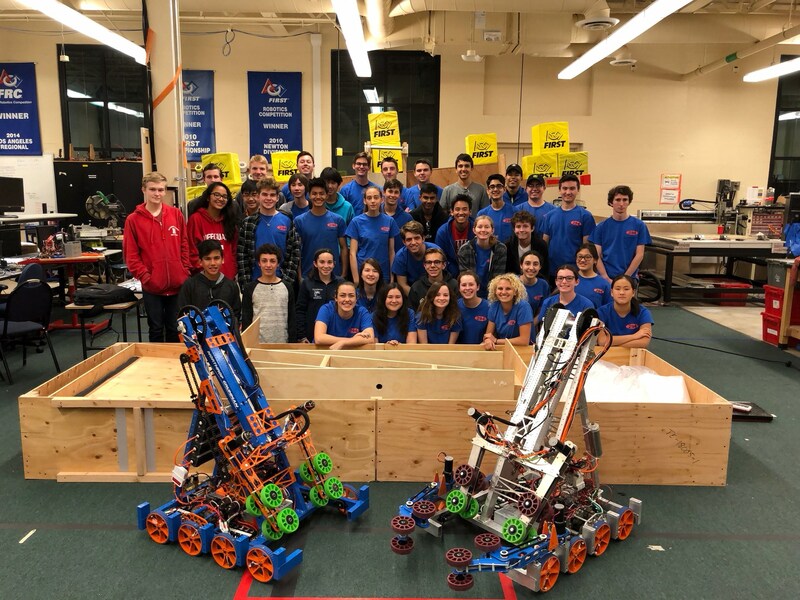 Our robot is the one with the 294 on the bumper (handily made with pool noodles!). 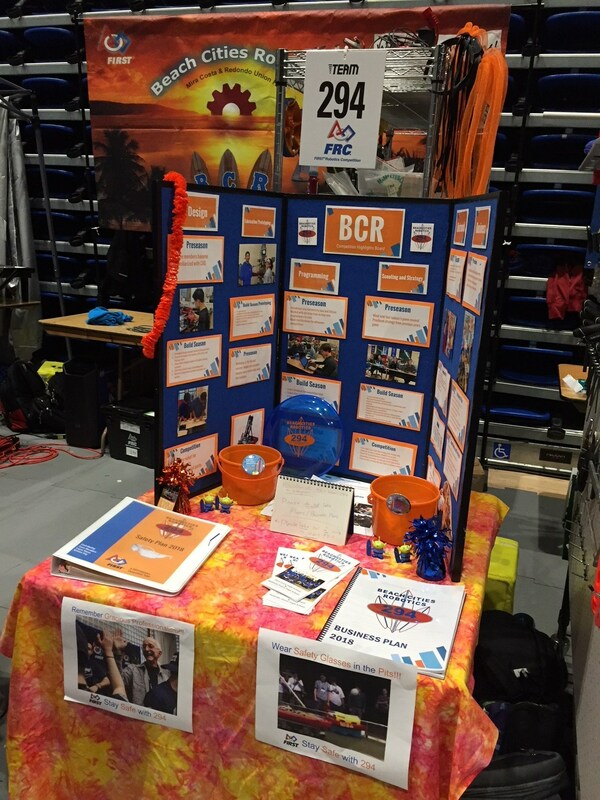 Over the weekend, Beach Cities Robotics competed in the Orange County Regional competition at UC Irvine. 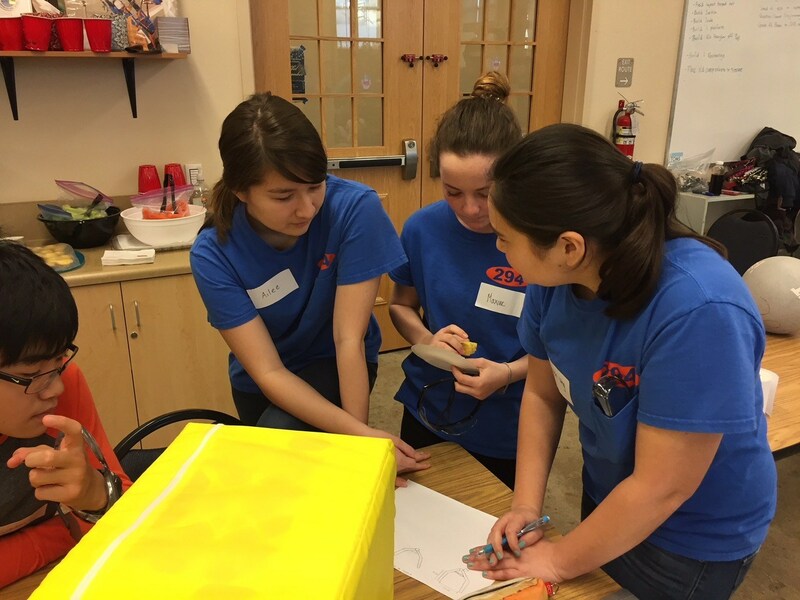 Out of 52 teams, we ranked 6th at the end of the qualification matches. At the end of the tournament, we finished 5th! 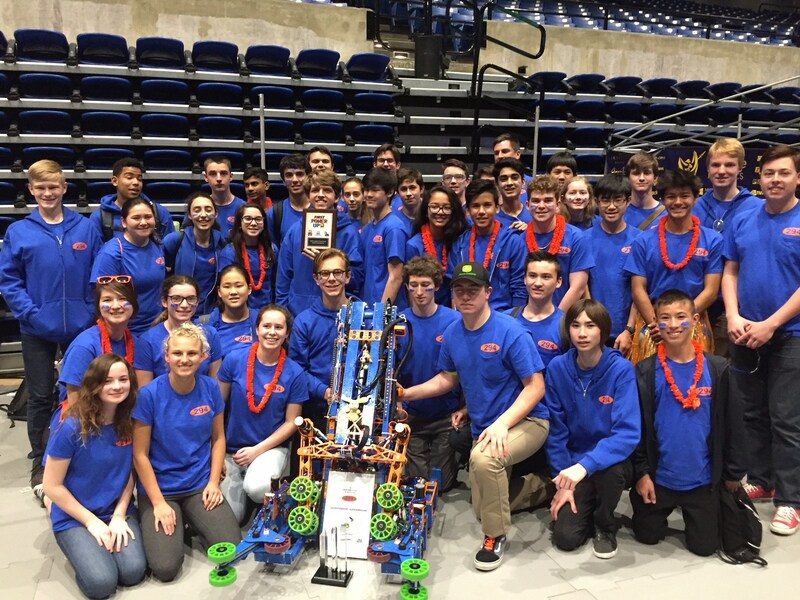 The team was also recognized for its programming and received the Innovation in Control award for our programmed regulators on the robot. 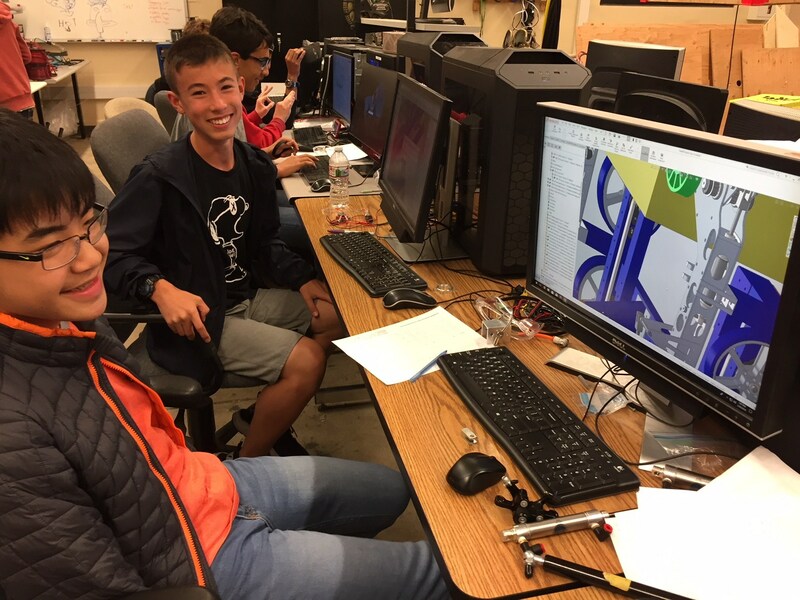 [I’m afraid for details on this since it is a bit beyond my level of technical understanding of programming, you will need to ask our lead programmers Jim Villani (senior) and Marley Edmonds (junior)]. Special shout-outs to senior Andy Barbee who lead the team’s scouting and strategy for the game over the weekend, and senior Kristen Ung for leading the presentation of our business plan to the judges throughout the weekend. Also, here is a video from one of our matches! Note: we start on the left side in the center. Our team number is 294. Please see the photos below for some great moments over the weekend! 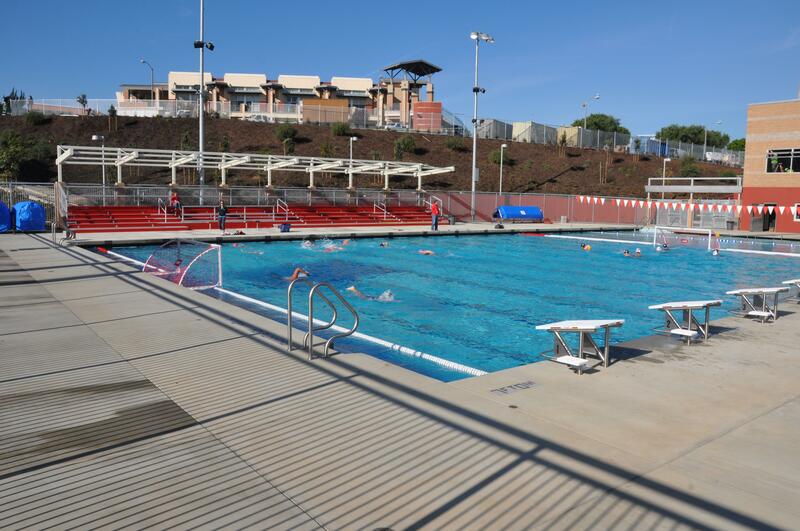 Our first competition is March 23rd and 24th at UC Irvine’s Bren Events Center. The event runs all day both days! 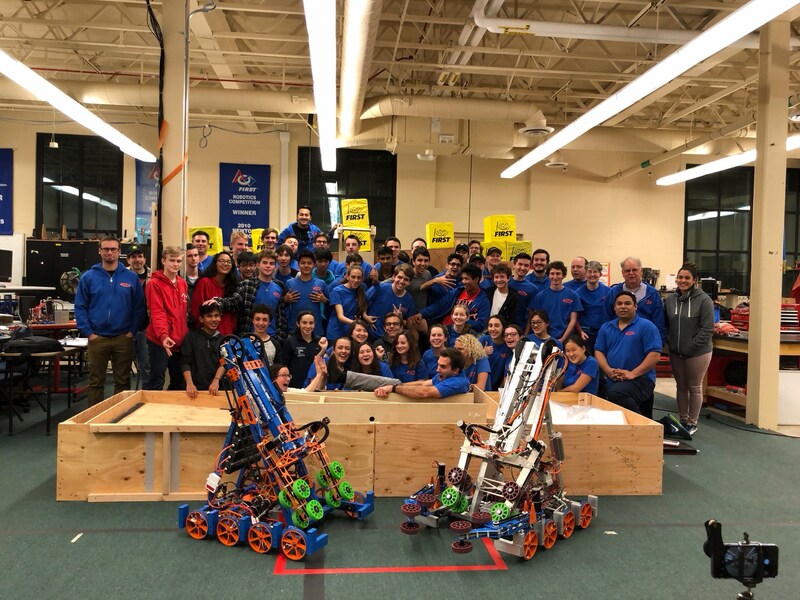 This is the mid-season update from Beach Cities Robotics. This week marked our halfway-point in the season. 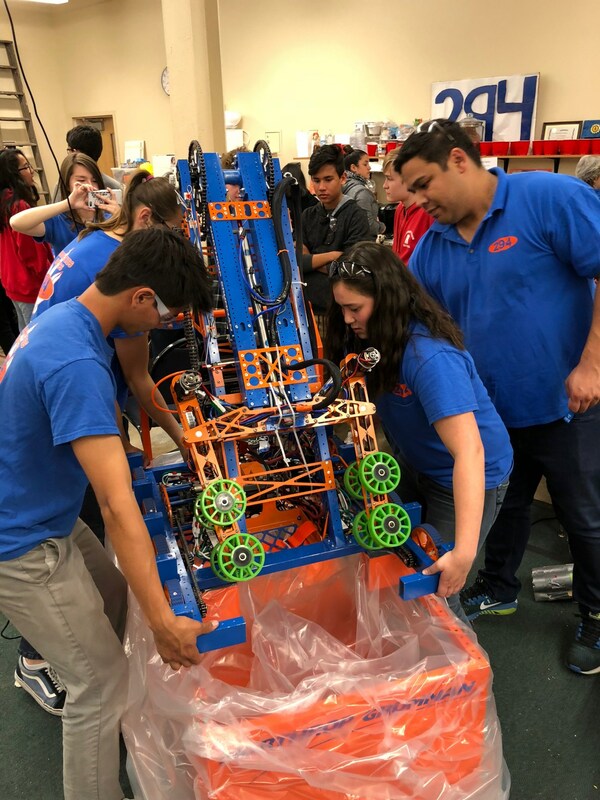 This is a key point in the season, as it marks the date we must stop working on our competition robot and place it into a large plastic bag until our first competition. Our first competition will be March 23rd and March 24th at the Bren Events Center at UC Irvine. While it is a bit of a drive, the event is a lot of fun and offers many things for those of all ages to enjoy! Other than paying for parking, the event is free! If you are interested, I encourage you come by for a bit to check it out and support our kids! I can also recommend some great options for lunch and ice cream if you are in the area! 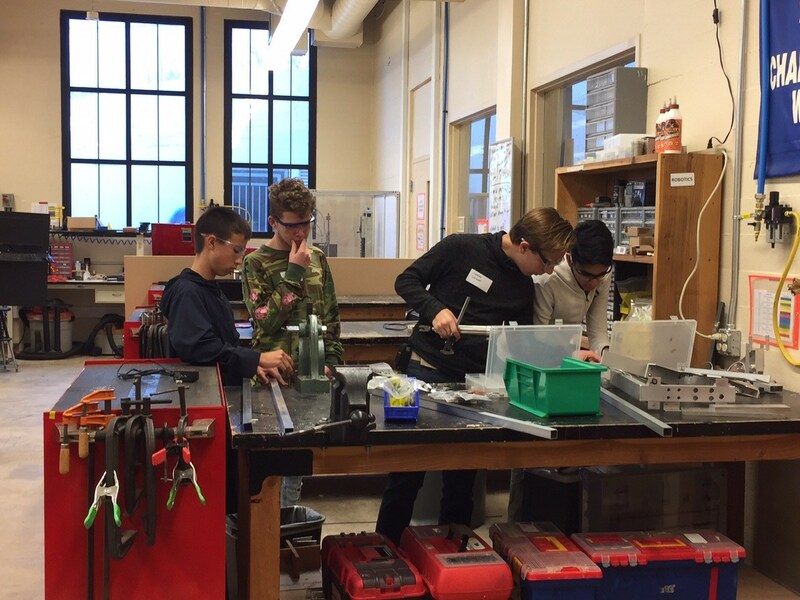 In the meantime, the students are busy in our lab preparing for their judging presentations, machining spare parts, and testing the programming code on our robot duplicate (see the attached photos). 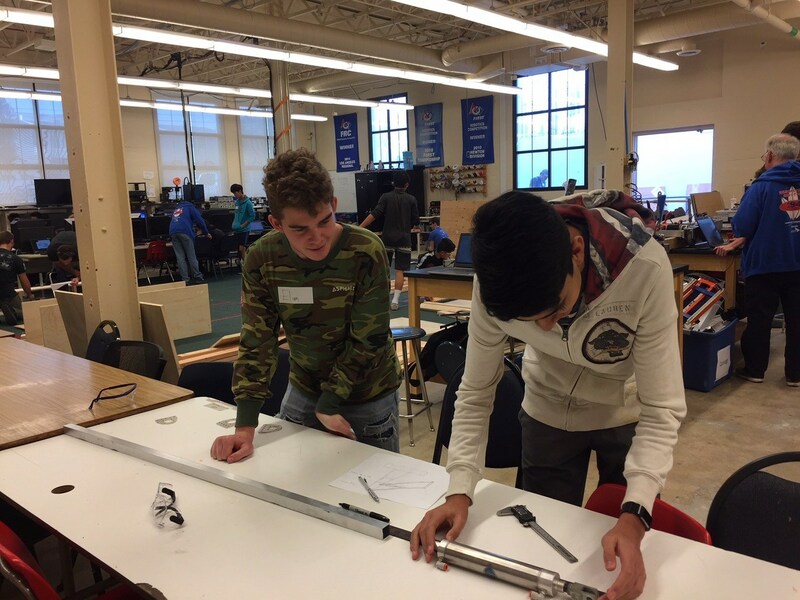 The defining feature of our robot is that it has a 12 inch telescoping arm (it extends up and out to lift boxes) powered by pneumatics and motors. 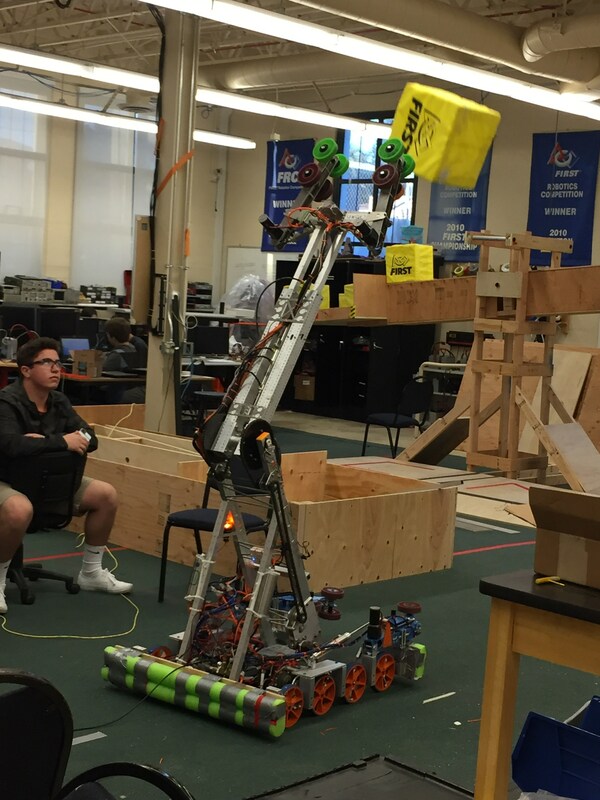 When the arm is lifted, the robot is over 7.5 feet tall. The claw-shaped grabbers on the robot can grab the plastic game cubes from any angle on the field. This includes 8 wheels (4 per side) powered by motors. The intake for cubes can fold down, giving us more angles with which we can grab cubes. It uses motors with 6 wheels to achieve this. The 8 wheel west coast style driving base can travel at 19 feet per second (that’s 13 miles per hour!). 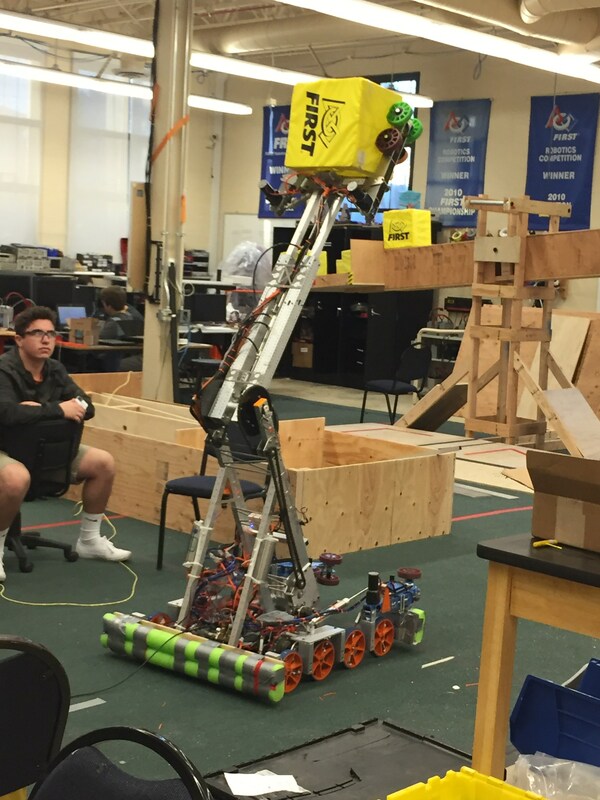 The robot is programmed to autonomously (i.e. not manually operated) travel across the field and place a cube into an elevated scoring platform. 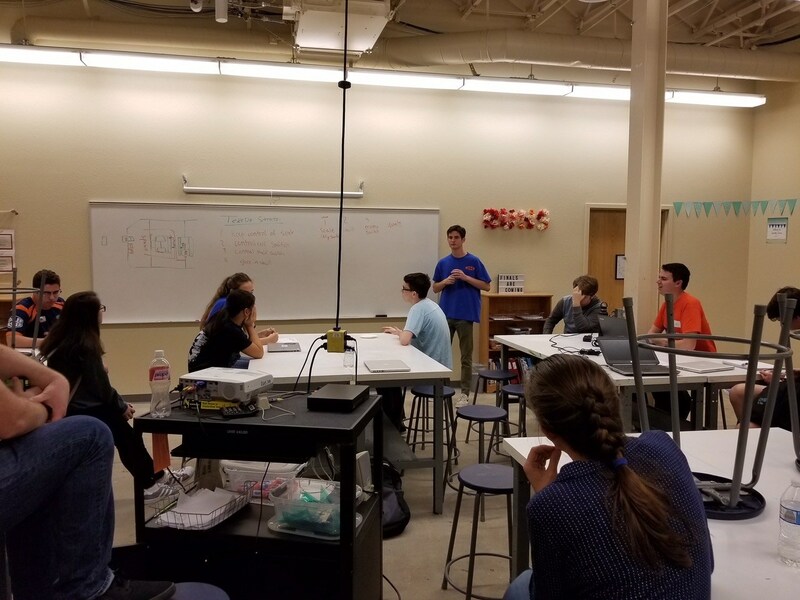 The robotics team officially kicked of our 2018 season on Saturday, Jan. 6, when the new game “Power Up” was released. 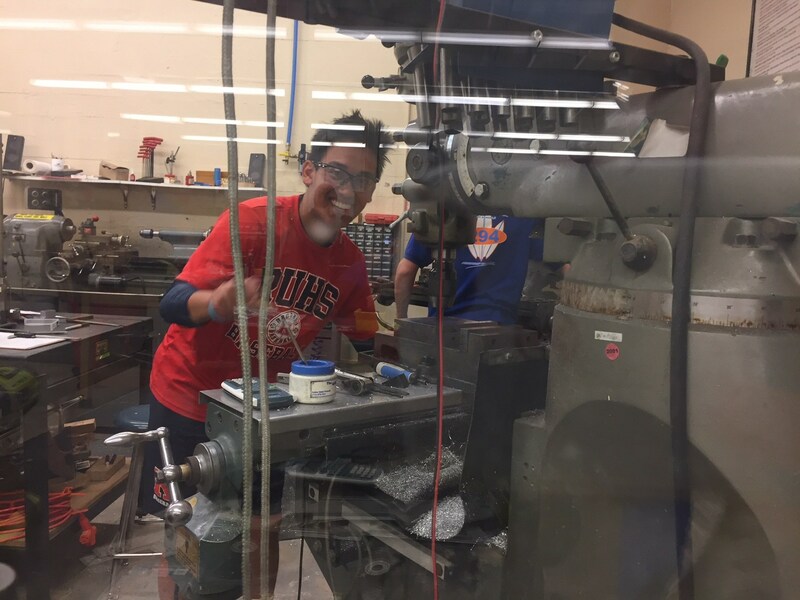 For those interested in the game we are designing the robot for this year, here is a link to the game explanation and animation. Our team’s volunteer mentors and students carefully read the rule book (it’s over 100 pages!) and then did a game simulation. 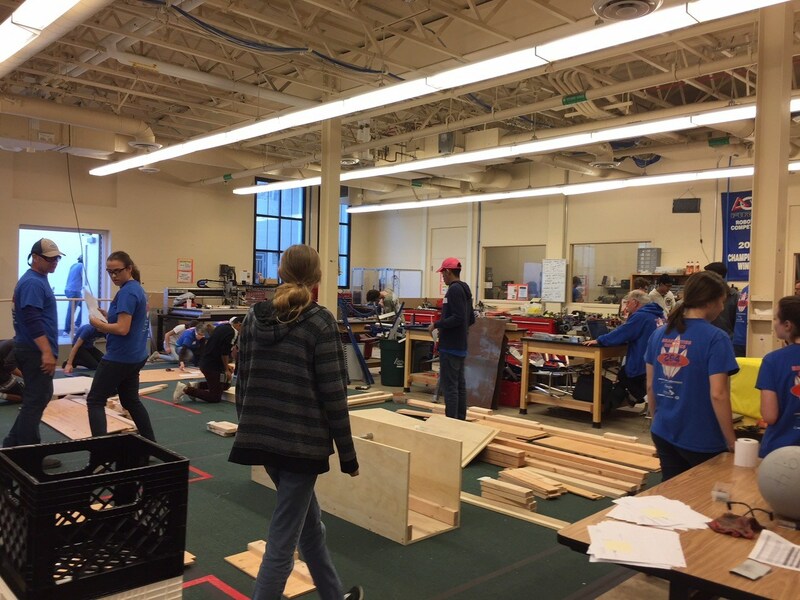 Mentors started gathering materials and organizing supplies so we could build a wooden game field replica in our lab for practice. 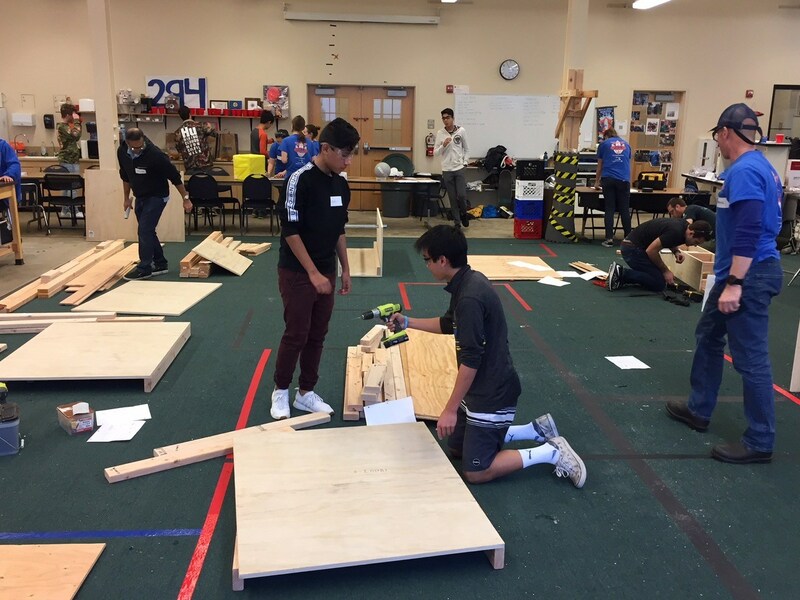 On Sunday, Jan. 7, our mechanical student team completed the game field and began designing prototypes for the new robot’s mechanisms. 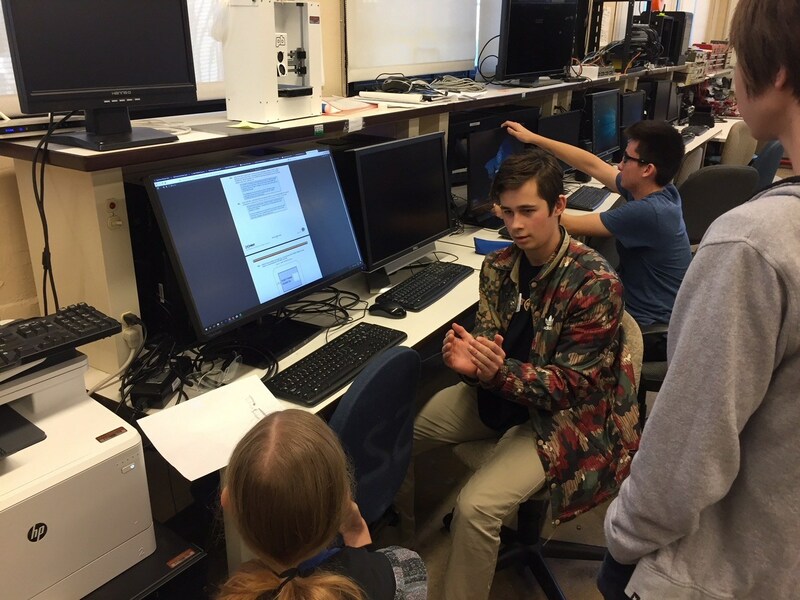 In addition, our programming/strategy student team began to break down the rules and started the beginning stages of forming a strategy for the team. This will be an essential part for the team’s success in this year’s game.